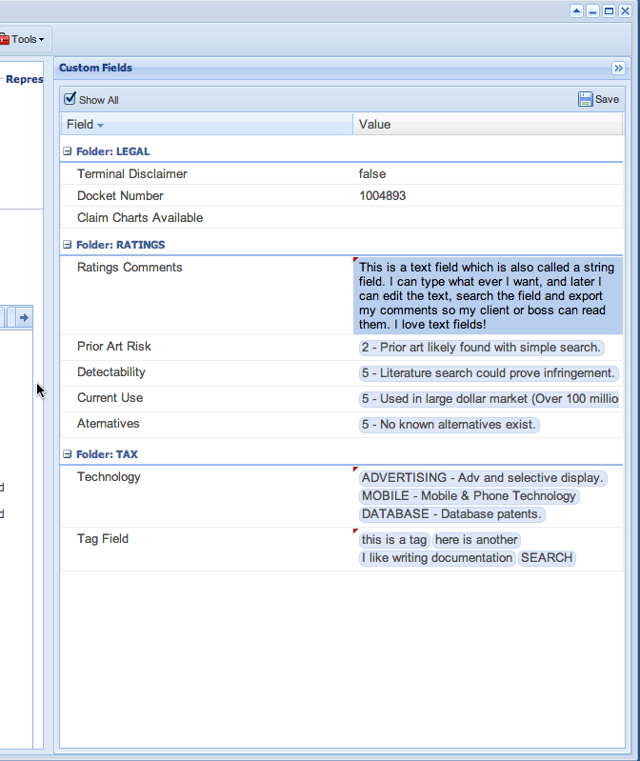 At the document level you can view and/or modify custom data from the Document Details window. Custom fields appear to the right in an accordion-style panel labeled "Custom Fields." 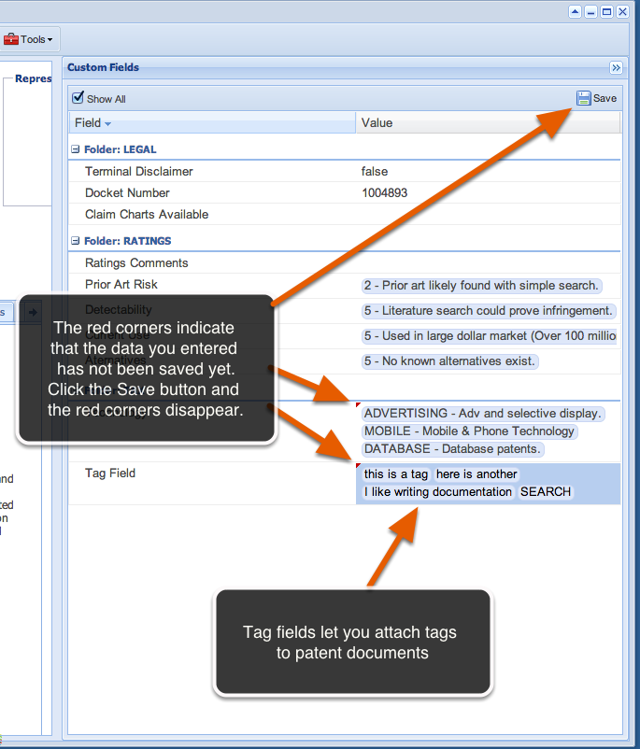 Custom field data appears in a panel on the right side of the Document Details window. The panel can be opened or closed by clicking the >> button (1). 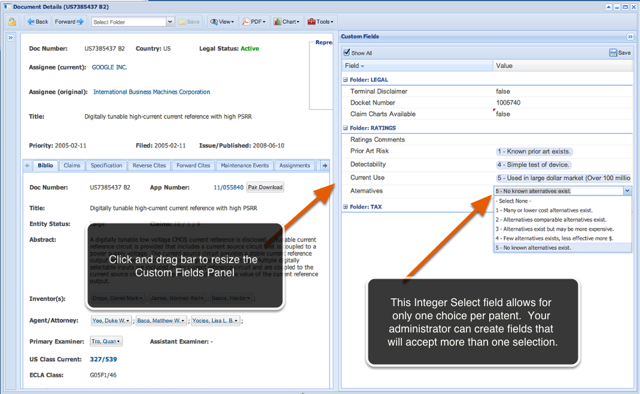 Your custom field administrator(2) may choose to organize custom fields into sets. In this example, all the RATINGS fields are organized together in a field-set called RATINGS so they always appear together. 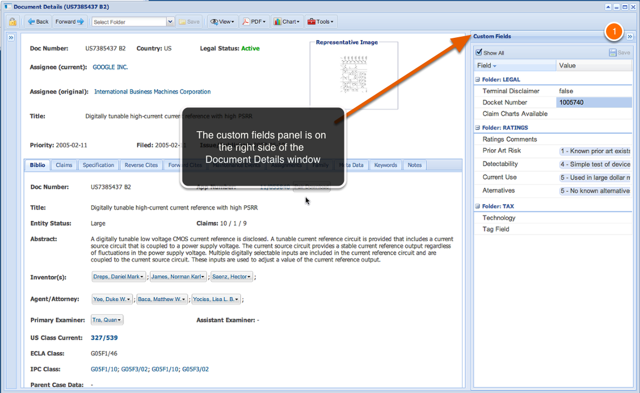 The Custom Fields Panel can show only the fields you are currently working with. You can expose additional columns other than the field title and the data values. For example, if you want to know the field code to query a field later, you can find it by clicking the column header and checking the column called "Field Code"
Notice all custom field codes begin with a leading underscore character. Custom fields can be edited directly in the Custom Fields panel IF YOU HAVE BEEN GRANTED EDITING RIGHTS. Your administrator can determine if he/she wants you to edit the fields. For example, it is a good idea to have your Docket Number or other internal asset ID number to be READ ONLY meaning that users cannot edit them, but users can search, sort and export them. Your administrator has the ability to update custom fields in bulk by uploading bulk data from spreadsheets. Depending on the field-type specified by the administrator and the permissions granted, you will have various editing options. Just double-click the field the the editing options available to you will be displayed. In the example above I displayed the fields that I want to see for my patents. The open field, "Alternatives," provides for options of choosing one best answer. Notice in this example each integer value (1 through 5) has an associated short description. The description appears in the user interface, but only the integer value is stored in your company's data core. 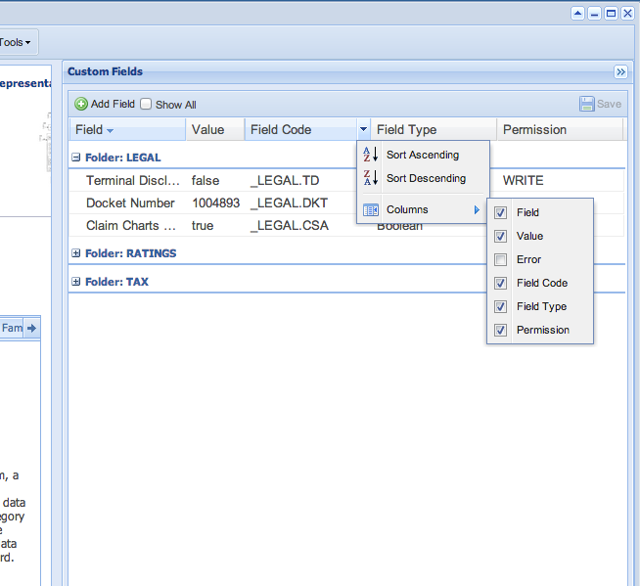 Fields that have pre-defined allowable values can be set to accept one best choice or multiple options. In this example, you can select more than one "Technology" to which the patent relates to. You still need to choose from the pre-defined list (other cases allow you to create your own notes and tabs using free form text. Select Combo fields are useful for taxonomies if your company or organization has an agreed-upon set of categories and do not want users to type in "Communication" when you want "Communications" (with the s). Your data will be much cleaner if you define allowable values when it is appropriate. 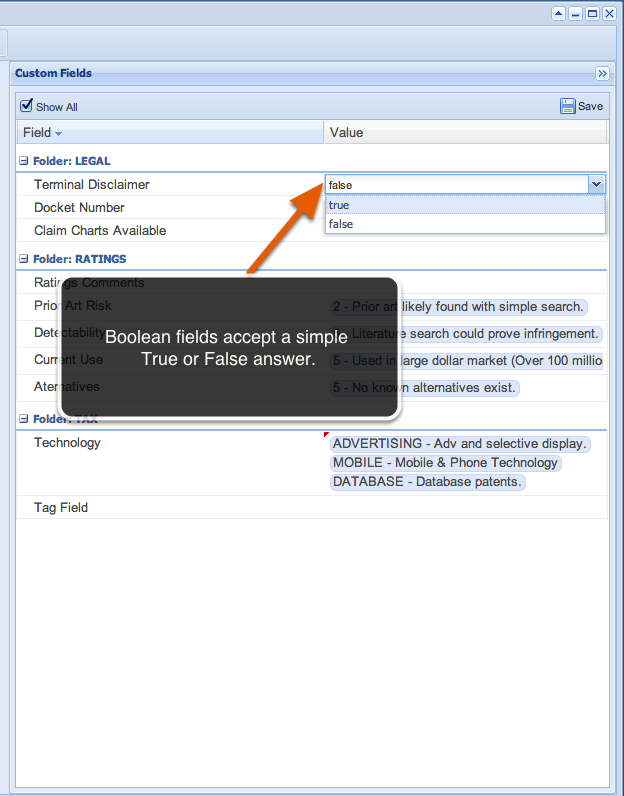 Boolean fields accept only two values, True or False (or T or F) for short cuts. In this example, we are only saying that there is or is not a terminal disclaimer present. Text fields accept free-form text. They are used for notes, comments and opinions on your patents. 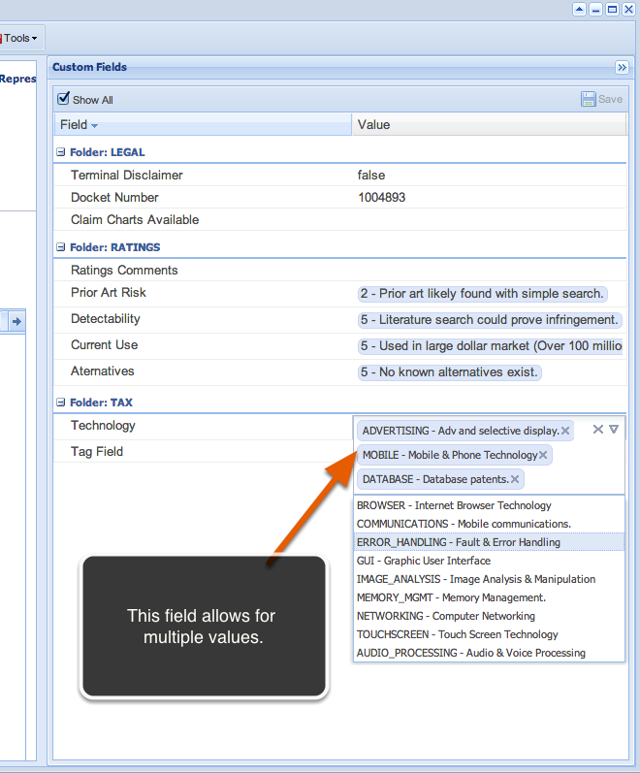 Tag fields allow you to enter in values without any predefined restrictions, and tag fields can contain multiple values per field. Tags can contain spaces. To add a second tag, just type the comma character on your keyboard and a new tag will be created. Each tag will become its own facet, so it is a good idea to try to stay as consistent as possible if you want to be able to filter your future search results by these tags. AcclaimIP supports integers, decimals and date fields as well. Your administrator can set minimim and maximum bounds for all three of these field types. For example, only accept dates between a certain range, or numbers in a range they define.